Peaceful Parent, Happy Siblings: How to Stop the Fighting and Raise Friends for Life by Dr Laura Markham is a book which advocates Peace between parents and their children. – Before the new baby and through the first year. Getting siblings to get along is never easy however it is possible to reduce the friction between them. Many a time the errant behavior doesn’t get correct as the child doesn’t own the misbehavior. They need to be intrinsically motivated to change for the better. They need to be taught how to identify and communicate their needs and feelings. Parents can show how siblings can interact nicely with each other through doing the following. – Coaching the children to put their feelings into words without attacking the other child. By helping their children work out their feelings and emotion they will be able to understand each other better and reduce the friction between siblings. Children need to be thought how to problem solve as these are essential skills to have so that they can survive in today’s world. Having the kids live side by side in harmony is any parent’s dream. Constant bickering and fighting have been driving me up the wall and I certainly wish for more moments of peace and tranquility within our household. There are many useful tips in Dr Laura’s book on how to deal with discord between siblings and also how to coach them how to deal with disagreements using peaceful means. Learning to return yourself to calm is one of the most important actions you can take to strengthen your child’s relationship with each other. I find this statement in the book extremely important in keeping the peace in a family. It hasn’t been easy to remain calm when the kids are at each other throats . Being calm it’s something that I hope to achieve with my own kids and become a peaceful parent myself. I found the book really useful and will be implementing the negotiation tools that I’ve learned in the book with the boys. I’m looking forward to less bickering in our household and more PEACE between the siblings. 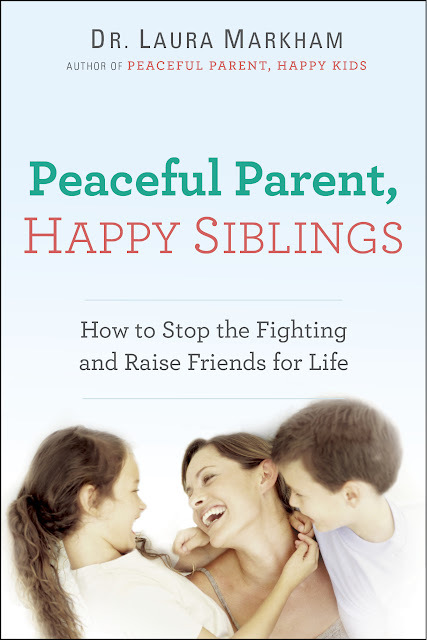 Do get a copy of the book Peaceful Parent, Happy Siblings: How to Stop the Fighting and Raise Friends for Life if you are interested to gain some tips on how to raise Happy siblings.